This dial grill thermometer is designed to indicate when your grill is at the perfect temperature for grilling and searing. It is 2" wide with easy-to-read numbers, and has a temperature range of 150 to 700 degrees Fahrenheit. To use, place the thermometer directly on your grill or griddle. 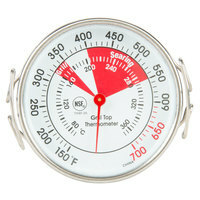 This dial thermometer can be easily lifted off the grill with tongs or a spatula. These are good just to make sure that your grill is actually cooking off at the temperature that you knobs state they are. Try to keep it clean though because you don't want to cross contaminate with a thermometer. Great product though and handy to have from Webstaurantstore.com. Sits right on top of a grill to give an indication of the temperature range you're hitting. I prefer infrared, but this works on flat grills. Great value for the price. Good for calibrating a flat top. Takes a while for the thermo to actully get to the correct temp but really good price. My chef really likes this. We had some issues with our grill temperatures, but in utilizing this thermometer we were able to determine that our flattop grill was not calibrated correctly. We also determined that one of the ovens in our double stack was actually lower than it should have been. This is a really effective and necessary thing to have. I needed this to test our pizza oven because it went to a higher temp. Works good- oven doesn't. I just put it on aplate and ran it through the oven. Good, easy to read dial. I purchased this as verification that my ovens are holding temp. It appears to function well and syncs up with the set oven temp. I would buy again as need arises. I got this for my husband since he fried our cheaper one in the grill. Easy to read and works as it claims to on the grill. A very reasonably priced thermometer for checking the surface of a griddle. it takes a bit of time for the thermometer to react, but it works. Can't beat the price on it. Love this thing! It is very heavy so it makes great contact with the grill. It responds quite fast and is easy to move arounf with tongs or spatula, it is also very easy to read. This thermometer is the greatest!! I use it often to check grill temperature for cooking meats. It also helps when you think your grill is on its way out, to see where your at for the temp. A handy gadget to have. I was really, really hoping that this would work better than it does. Not that it doesn't accurately tell you the temp, because I'm sure that it does, but the problem lies within the -time-. This thing takes FOREVER to read the temp. And that just isn't acceptable when you're trying to calibrate your flat top. Disappointed. Thank you for your review! This thermometer is a great value, but we're sorry to hear it was disappointing - please feel free to contact a Customer Solutions Representative. The Taylor 3506 oven thermometer is another option with many positive reviews. I bought 4 of these thermometers to calibrate the 48" griddle i refurbished. i replaced the 4 thermostats on the griddle with new ones and converted from Natural Gas to LPG. I placed the grill thermometers over the thermostats in the griddle plate and they worked very well. i was able to dial in the thermostats because LPG burns hotter than Natural Gas. I now use them to make sure the griddle plate is up to temp before cooking and watch for griddle creep. They are very durable as well. This is a decent thermometer for grills. It is easy to attach and is very accurate. Nice large range of temperature readings. Great for ovens too. Great grill thermometer! Very large dial face makes it easier to read!! Great tool for preheating the grill to the proper temperature!! Easy to calibrate!! Wonderful small thermometer that can be easily slid to any part of your grill surface to get a temperature reading. It is well made to last. Grilling has a little guess work to it for me. This thermometer is right on target and takes the guess work out of grilling. Works very well and allows me to keep that right temperature. Great product. Would recommend. They work great while they last, but it's a good thing they're cheap... Keep a couple of back-ups around. After a few months of regular use the needle sticks (always makes me frantic trying to figure out what's wrong with my grill), giving you a false reading. Good while they last, though. I cant believe how inexpensive these are! heavy duty and works great! just put it on the grill and no more guessing if the grill is hot enough. perfect! I've never seen a Grill-Top Thermometer this nice ! Ones I've used in the past were very lightweight - it took little to dislodge them. After just one or two Grilling sessions their faces would darken and be unreadable. Junk. And they weren't cheap ! This rugged instrument weighs 5 Ounces - which is a lot. And including the handy placement hooks it's over an inch high ! Would buy again - though I doubt I'll need to !